“Cesar Chavez,” directed by Diego Luna, is a well-cast, well-intentioned movie that falls into the trap that often awaits film biographies of brave and widely admired individuals. The movie is so intent on reminding viewers of its subject’s heroism that it struggles to make him an interesting, three-dimensional person, and it tells his story as a series of dramatic bullet points, punctuated by black-and-white footage, some real, some simulated, of historical events. In spite of these shortcomings, Mr. Luna’s reconstruction of the emergence of the United Farm Workers organization in the 1960s unfolds with unusual urgency and timeliness. After a rushed beginning — in which we see Chavez (Michael Peña) arguing in a Los Angeles office and moving his family to Delano, a central California town, before we fully grasp his motives — we settle in for a long, sometimes violent struggle between the workers and the growers. Attempted strikes are met with intimidation and brutality, from the local sheriff and hired goons, and Chavez and his allies (notably Dolores Huerta, played by Rosario Dawson) come up with new tactics, including a public fast, a march from Delano to Sacramento and a consumer boycott of grapes. As is customary in movies like this, we see the toll that the hero’s commitment takes on his family life. His wife, Helen (America Ferrera), is a steadfast ally, but there is tension between Chavez and his oldest son, Fernando (the only one of the couple’s eight children with more than an incidental presence on screen). Fernando (Eli Vargas) endures racist bullying at school and suffers from his father’s frequent absences. Their scenes together are more functional than heartfelt, fulfilling the requirement of allowing the audience a glimpse at the private life of a public figure. We also venture into the household of one of Chavez’s main antagonists, a landowner named Bogdonovich, played with sly, dry understatement by John Malkovich. He is determined to break the incipient union, and the fight between the two men and their organizations becomes a national political issue. Senator Robert F. Kennedy (Jack Holmes) takes the side of the workers, while the interests of the growers are publicly defended by Ronald Reagan, shown in an archival video clip describing the grape boycott as immoral, and Richard Nixon. 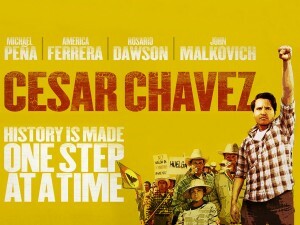 Parts of “Cesar Chavez” are as rousing as an old folk song, with chants of “¡Huelga!” and “¡Sí, se puede!” ringing through the theater. Although it ends, as such works usually do, on a note of triumph, the film, whose screenplay is by Keir Pearson and Timothy J. Sexton, does not present history as a closed book. Movies about men and women who fought for social change — “Mandela: Long Walk to Freedom” is a recent example — treat them less as the radicals they were than as embodiments of hope, reconciliation and consensus.